MEMORIAL RAID. On the 4th, in their customary heavy-handed and secretive way, police raided the St Petersburg offices of Memorial and took some documents. As usual, there are many more theories than facts: this blog entry summarises the various theories. The official line is that the raid was conducted pursuant to hate-crime laws (a notoriously broad category that can justify almost anything in Russia and elsewhere), although it seems improbable that Memorial is connected to an anti-Semitic film. Like so much else in Russia, the few known facts will be used as a peg on which to hang one’s pet theory. DEMOS. 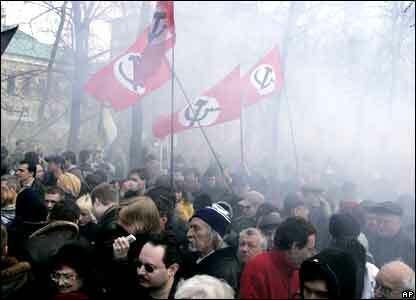 The authorised nationalist march on the 12th attracted a few hundred people and passed off without incident. Other Russia, typically refusing the sites it was offered, tried to hold its protest at Triumfalnaya Square (which has to be one of Moscow’s busiest intersections) but few showed up. PEOPLE POWER. There were, however, real demonstrations on Sunday. A number (thousands say some, a negligible number say police) in several cities in the Far East protested the large tax increase on imported cars that is due to come into effect next month. Many people east of Baykal drive second-hand cars from Japan (with right-side driver’s position, which adds a certain frisson to traffic conditions). JURY TRIALS. On the 12th the Duma passed amendments to the Criminal Code eliminating jury trials for cases involving crimes like terrorism, treason, sabotage; the Federation Council passed it yesterday. Such cases will be heard by a panel of three judges. The stated reason is that, because so many of these sorts of crimes occur in the North Caucasus and there is such a network of family and clan there, objective juries cannot be found and, when found, jurors are easily threatened. RUSSIA INC. The government’s official line remains optimistic: Russia will make it through. Moody’s has reduced Russia’s rating from “positive” to “stable” (Baa) and Standard and Poors to BBB in the wake of a drop in the ruble’s value and the fall in oil prices. According to the Finance Ministry, the federal budget surplus was about 6.3% of GDP in the 1st 11 months of the year. Meanwhile, RosStat reports that industrial production declined 8.7% this year compared with last. An official stated that foreign reserves were US$435.4 billion last week: down nearly $150 billion since the crisis began. He was hopeful that reserves will stay above $300 billion. We shall see: certainly the world-wide crisis has not yet bottomed. CORRUPTION. Some fairly high-profile arrests lately. A criminal case on abuse of office has been opened against the former Russian Pension Fund head, the Investigative Committee arrested a Moscow deputy prosecutor for soliciting a bribe and today an aide to the Ground Forces Commander was arrested for taking a bribe. However, the Duma has delayed, by a year, the date of coming into force for Medvedev’s package of bills; Medvedev is said to be very angry. GEORGIA. US Senator John Kerry, visiting Georgia, was told by opposition members that Saakashvili was a threat to Georgia and the world, Matthew Bryza (can we call him Tbilisi’s man in Washington?) was told by another leader that the opposition would attempt to force early elections and hoped the next US administration would “respect the choice of the Georgian people”. Zurab Noghaideli (PM Feb 2005-Nov 2007) stated that Saakashvili was incapable of governing Georgia: “The time of children playing in the sandbox is over in Georgia”. There must be more Saakashvili-era ministers in opposition today than in his cabinet. And, the rumour is that Georgia’s Ambassador to the UN is about to declare his opposition. GAS WARS. Negotiations between Gazprom and Naftohaz continue without resolution despite the framework agreement between PMs Tymoshenko and Putin of October; the present contract expires in January. In the meantime, it is reported that local gas suppliers in Ukraine are beginning to cut off customers for non-payment. President Yushchenko just announced that Ukraine had paid US$800 million with another $200 million coming soon. This will still leave a debt of about one billion. CAUCASIAN RUMOURS OF WARS. I have been noticing an increase in jihadist attacks in the North Caucasus over the past summer: Gordon Hahn’s essay on new tactics (JRL/2008/22740) puts this into context. PUTIN Q&A SESSION. Putin answered questions on Russian media today. Most of what he spoke about was connected with the economy – he remains reasonably optimistic – and the financial crisis – ditto – and other “money” issues. NATO EXPANSION. At its meeting in Brussels NATO did not offer MAPs to Georgia or Ukraine. It also began a retreat from its decision not to deal with Russia. Typically, this was covered up by waffle language but that is the bottom line. As someone wisely observed, NATO is “becoming the problem that it had been trying to solve”. No one can doubt that the Ossetia war was a by-product of NATO expansion which was sold as a means of creating stability, not reducing it. We will see whether this marks the end of this foolish project, or “tragic mistake”, as George Kennan put it in 1998. The latest poll from Ukraine shows what a divisive issue it is there: over 80% want a referendum before joining and only 30% said they would vote to join. 16% in eastern Ukraine supported NATO membership, 28% in the central region and 68% in western Ukraine. LATIN AMERICA. Medvedev has been visiting countries in Latin America that Washington does not like. Part of this I suspect is the perennial attempt to get customers for something other than oil and gas and part of it is an attempt to irritate Washington and show that Russia is a force to be taken seriously. KARABAKH. The optimism of last month’s agreement signed by the Presidents of Russia, Armenia and Azerbaijan is fading. There was a protest in Yerevan a few weeks later by war veterans calling “the liberated territories” “an integral part of our Motherland” and any cession “treachery”. On the other side, Azerbaijan President Aliyev told RAI International that the agreement did not rule out the use of force. Karabakh is another of Stalin’s cartographical jokes and should never have been included in the Azerbaijan SSR in the first place. As a result of the war, the Karabakh-Armenian forces have occupied a good piece of territory to the west of Karabakh which are, typically in the Caucasus where history and historical myth are so strong, already being considered part of the “Motherland” by some. Just as many Georgians consider the Empire of David to be the “true” extent of Georgia, there are Armenians who consider the Empire of Tigranes to be the “true” Armenia. And so it goes, with a lot of blood shed to intensify feelings. UKRAINE-RUSSIA. President Yushchenko’s party, People’s Union “Our Ukraine”, held its conference and declared that Russia was a threat to Ukraine and that many politicians ignored this reality to the detriment of Ukraine’s independence. As far as I know the word “Tymoshenko” did not appear in the statement. On the other hand, it is reported that Yushchenko has set up a group to improve ties with Russian Federation in face of the financial crisis. Kiev’s Ambassador to Moscow pointed out that Russia, Ukraine’s largest trade partner with turnover of about $30 billion, must be Ukraine’s partner in finding a way out. The National Security Council Secretary said, in reference to the party’s statement: “It is unacceptable when our partner is branded a national security threat”. Reality bites. Meanwhile it is announced that Naftohaz Ukrainy has been able to pay for September’s gas imports. Leaving, I suppose, October and November still to be paid for. GEORGIA. I highly recommend that people watch this interview with Erosi Kitsmarishvili, the former Ambassador to Moscow and quondam ally of Saakashvili. In essence he says that: Saakashvili has betrayed the “Rose Revolution” (in which Kitsmarishvili was an important ally); Washington was stupid not to see what manner of man he was; Saakashvili started the war because he wanted to be another David; there is more than a hint that he believes Saakashvili, or someone close to him, had Zurab Zhvania murdered; all news outlets in Georgia are government-controlled and the population has few other sources of information and therefore the opposition must move slowly and carefully. Finally Georgia cannot exist without good relations with Russia. He says he will sue the government to regain control of the TV station he helped start (Rustavi-2), no doubt as a first step in breaking the government’s control. That’s a lot of former allies of Saakashvili now in open opposition: including now the PM from February 2005 to November 2007, who set up his opposition party yesterday. Hard to keep up with them, in fact.